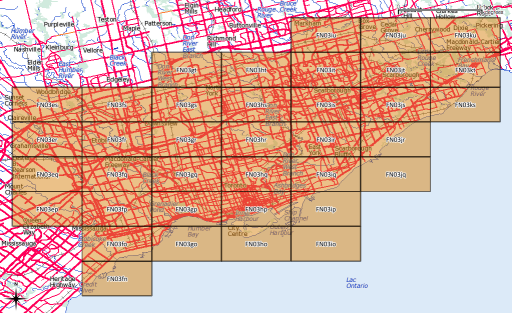 After yesterday’s post, I went a bit nuts with working out the whole amateur radio grid locator thing (not that I’m currently likely to use it, though). I’d hoped to provide a shapefile of the entire world, but that would be too big for the format’s 2GB file size limit. A Perl program that will generate a shapefile of an entire Maidenhead grid field, down to the subsquare level: make_grid.pl. You’ll need Geo::Shapelib to make this work. 324 (= 182) of these files would cover the whole world, and at 8MB or so a pop, things get unwieldy quickly. A Google Earth KML file covering the whole world in 20° by 10° grid fields: Maidenhead_Locator_World_Grid. (If you’re feeling nerdy, here it is in Shapefile format: Maidenhead_Locator_World_Grid-shp). Several people have asked, so here’s how you convert to KML. You’ll need the OGR toolkit installed, which comes in several open-source geo software bundles: FWTools/osgeo4w/QGis. Let’s assume we want to make the grid square ‘EN’. Previous PostMaidenhead Grid Locator, in PerlNext PostBixi comes to Toronto! I wonder if you could make one for the world now using the Esri geodatabase api? In fact..if you can extract the world into shape files and put them in a cloud folder, I could download them and replace it with an Esri geodatabase of a seamless layer.